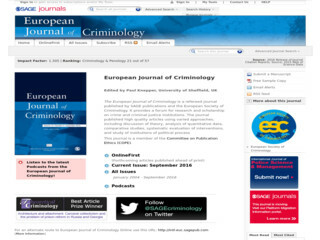 European Journal of Criminology: The European Journal of Criminology is a refereed journal published by SAGE publications and the European Society of Criminology. It provides a forum for research and scholarship on crime and criminal justice institutions. The journal published high quality articles using varied approaches, including discussion of theory, analysis of quantitative data, comparative studies, systematic evaluation of interventions, and study of institutions of political process.